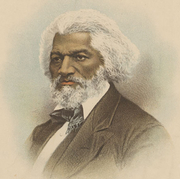 As part of the Hartford History Center’s February programming of issues and literature key to African American life, Stan Simpson of Fox CT will lead an informal discussion of the immortal autobiography of black abolitionist and leader Frederick Douglass. The Narrative of the Life of Frederick Douglass was first published in 1845, and is a short, hard-hitting classic by a man who escaped enslavement to become a national and world leader in the fight for black emancipation. To register go to www.hplct.org Books are available on a first-come, first-served basis in the Hartford History Center. Betsy Means of WomanLore discusses Narrative of the Life of Frederick Douglass, an American Slave. Frederick Douglass has a Legacy Library. Legacy libraries are the personal libraries of famous readers, entered by LibraryThing members from the Legacy Libraries group. » Frederick Douglass's legacy profile. Frederick Douglass is currently considered a "single author." If one or more works are by a distinct, homonymous authors, go ahead and split the author. Frederick Douglass is composed of 9 names. You can examine and separate out names.